While I try to avoid euphemisms, I’ve yet to find an elegant way to refer what to do with a dead body. Straightforward terms such as burial and cremation work well on their own. But to refer to those and other methods collectively, we seem stuck with final disposition. The latest final disposition option comes with its own tangle of technical and market-friendly terms. Alkaline hydrolysis, also known as resomation, biocremation, and water or flameless or green cremation, is now legal in 15 states and three Canadian provinces. As indicated by the brand name for the form soon to be offered in Portland – “Aqua Green Cremation” – alkaline hydrolysis is being marketed as a greener alternative to traditional cremation, which burns the fossil fuel equivalent of driving nearly 5,000 miles and releases mercury into the environment. By contrast, one study finds alkaline hydrolysis, which uses lye and water to dissolve the body, delivering 75% less carbon impact. 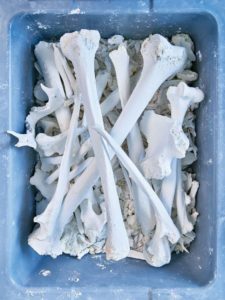 The remaining bones, just like those left in a cremation chamber, are ground into “ashes” which can be buried, scattered, kept, or ignored just like “cremains” produced through cremation. Learn more from this in-depth article in Wired, or attend our spring Natural Death Care workshop at River View Cemetery to hear directly from the business that will soon offer “Aqua Green Cremation” in Portland. People who know I’m a green burial advocate have been asking me about “green cremation” for a few years. Even with natural burial becoming more available (it constituted 30% of the whole body burials at River View last year, driving their total number of full body burials higher than their cremation interments for the first time in decades), some people have reasons they don’t want a burial. Price may be an issue (even the most no-frills green burial typically costs more than a no-frills cremation). “Not a good use of space” is an objection I hear often. There may be no interest in or support for the ritual pause inherent in a burial. Or there may be plans for the cremated remains that wouldn’t be possible if the body were buried. My own father’s cremation took place out-of-sight, out-of-mind. I’ve since supported others to witness the cremation of a loved one, to see their body into the “retort,” as the furnace is called, even to press the button to start the process. I applaud those families who remain hands on in caring for their dead throughout the process. I don’t know if that will be possible in the facility where “Aqua Green Cremation” takes place. But having stood around a gravesite as a body is given to the earth to feed the microbes and become soil, then to envision a body being placed into yet another industrial machine by a technician… my own preferences are becoming increasingly clear. I’m going with in-ground burial because I want to PRESERVE OPEN SPACE. Cemeteries may one day be one of the few places with trees in an urban area and I want to nourish those trees with my own decay. With you all the way, Holly.